‘What does it mean to make distinctively Californian Chardonnay?’ That was the question posed by Elaine Brown’s compelling recent tasting for the California Wine Institute. One of the world’s most versatile grapes, Chardonnay thrives in a wide range of climates and expresses nuances of site and winemaking with rare transparency. In France, it runs the gamut, from nervy Blanc des Blancs Champagne to the glossy richness of Bâtard-Montrachet. In the Golden State, Chardonnay has just as much potential for diversity, and Brown’s carefully-chosen set of wines charted how a succession of winemakers have interpreted this supremely pliant variety. Chardonnay arrived in California towards the end of the nineteenth-century, when wine pioneer Charles Wetmore imported budwood from Meursault and planted it in the Livermore Valley in 1886. Frenchman Paul Masson followed suit some fifteen years later, bringing cuttings from the hill of Corton; and in 1912, so did Ernest Wente, sourcing his vine material from the University of Montpellier. Prohibition, however, wiped California’s viticultural slate clean, cutting short anything resembling an emerging tradition. It was only in the 1940s that California began to take Chardonnay seriously. One pioneer was Martin Ray, an eccentric former stockbroker whose vineyards high in the Santa Cruz Mountains became Mount Eden Vineyards, still the source of one of California’s benchmark Chardonnays. Another was Stony Hill Vineyards in St. Helena, Napa Valley, where Fred and Elanor McCrea planted Chardonnay vines in 1947. This family-owned heritage winery has never changed: fermented in large, neutral oak vessels and matured on the lees without malolactic fermentation, these tense, firmly structured wines evolve at a glacial pace, offering a singular expression of variety and place. The 2010 Elaine poured at our tasting was still a decade from maturity. A decade later, another chapter in California Chardonnay’s story began with the foundation of Hanzell Winery in Sonoma County. Proprietor James Zellerbach and his winemaker Ralph Bradford Webb aspired to produce wines that could rival the great crus of Burgundy, and no expense was spared creating a state-of-the-art winery. 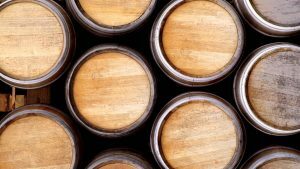 In 1959, Webb conducted the first controlled malolactic fermentation in North America, and he was also one of the first to employ small 60-gallon Burgundy barrels in which to mature his wines. So whereas Stony Hill remains a bastion of tradition, Brown suggested, Hanzell’s arrival on the scene represented the beginning of an era characterized by technical innovation in the cellar. Yet Hanzell’s 2011, precise and sapid, sat comfortably alongside the Stony Hill for all that, their different winemaking methods both employed in the service of a shared classical aesthetic. The next era in California Chardonnay’s evolution, according to Brown, was marked by introducing French techniques in the winery; a trend illustrated in our tasting by a wine from Jim Clendenen of Au Bon Climat. Celendenen worked at the Domaine de Duc de Magenta in 1981, and on his return to California employed many of the techniques he had learned, foremost among them fermentation in small new oak barrels and maturation on the lees. Brown’s argument is persuasive. As winemaker David Ramey puts it, ‘the story of California Chardonnay in the last three decades has been the gradual embrace of Burgundian methods’, and the three final wines in our tasting all offered variations on that theme. Hyde de Villaine’s generous but complex 2014, the product of a collaboration between Carneros grape grower Larry Hyde and Burgundian vigneron Aubert de Villaine encapsulated the trend. DuMol’s 2013 Russian River Valley cuvée, from a vineyard planted with unusually tight, French-style spacing, demonstrated that it’s a trend making an impact in the vineyards as well as in the cellar. And Sandhi’s 2014 Sanford & Benedict bottling, our concluding wine, tautly textural and framed by reduction, demonstrated just how close California can get to contemporary white Burgundy. Each of these wines had a charm of its own. All spoke articulately of where they came from and how they were made. And together, they demonstrated conclusively that California Chardonnay has come of age. It’s time to put caricatures aside and give it another look.